On a visit to Erbil on Divine Mercy Sunday, Cardinal Vincent has spoken to the media about the plight of Iraqi Christians who have been displaced from their homes and lands. During the trip, Cardinal Vincent visited Christians living in a refugee camp in Erbil. He witnessed first hand the difficulties these families are experiencing and the efforts being made to give them back their dignity. 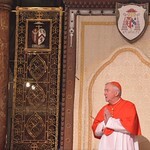 Cardinal Vincent has written a report for ITV News, which can be found here. The Cardinal has also spoken to Philippa Hitchen of Vatican Radio about the challenges that displaced Christians face in Iraq and about the hope they foster for a return to their homes and land. The interview can be heard here. On 14 April, the Cardinal spoke on BBC Radio 4 about his experiences. To watch the video, click here.